St Nectan’s Glen is a small wooded glen close to Tintagel. The glen would be pleasant but unremarkable except for a waterfall at the head of the glen where the water has carved a window through the rock. We visited during a dry spell, but were surprised that there was still plenty of water in the river. The waterfall is on private grounds, and tickets must be bought at the tearoom at the top of the waterfall. Wellington boots can also be hired, which are recommended as it requires some paddling to get a clear view. This is a popular spot, so some patience is required to get a shot of the waterfall clear of visitors. A graduated filter is useful to balance exposures as one side of the waterfall is in deep shadow. In the summer, the tea room also has some attractive flowers to photograph. 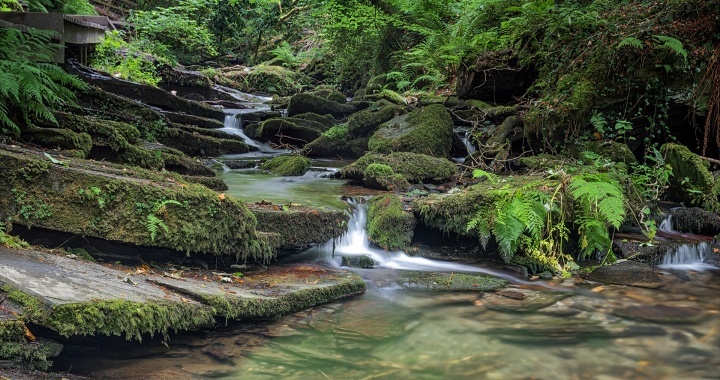 St Nectan’s Glen is located about mid-way between Tintagel and Boscastle. There is a small car park about 1.5 miles from either village on the B3263. If driving from Titntagel look for a sign for St Nectan’s Glen at the car park entrance, but from Boscastle the car park is immediately after a small bus shelter on the right. Cross the road and take the track that leads between the houses for 100 yards then turn right. After about 0.5 miles, the track ends, but a pleasant path continues beside the river for a further 0.5 miles until the St Nectan’s Tea Room is reached, from which there is a short descent to reach the waterfall. Posted in Cornwall and tagged Riverside, Waterfall.